It’s almost time for Philly’s 4th Annual Spring Cleanup! Last year the event attracted more than 11,000 volunteers working on 230 projects across the city. This year, Mayor Nutter and the Streets Department are hoping to top that, but can only do so with your help. To register as a volunteer, or submit a project request (TODAY is the deadline!) 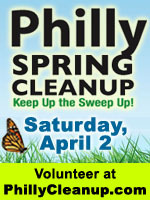 visit: phillycleanup.com. The volunteer page will assist you in finding a clean-up project right in your neighborhood, where you’ll team up with fellow volunteers. So what are you waiting for? Register today and help beautify our city. Saturday, April 2nd, 9 a.m. – 2 p.m.